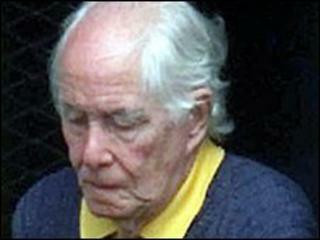 Great Train Robber Ronnie Biggs has been admitted to hospital in London after complaining of chest pain. Biggs, 80, underwent tests at Barnet General Hospital earlier and is expected to remain in hospital overnight. "He had pain in his chest this morning, he's conscious but he's in a lot of pain," his son Michael said. Biggs was released from prison on compassionate grounds in 2009 because of health problems. He has been living in a care home in Barnet. Speaking from the hospital, Michael Biggs said: "He had his tests earlier today. We still don't know what's wrong with him and we are waiting to see the surgeons to find out what the tests uncovered." Originally from Lambeth, south London, he was among a 15-strong gang which attacked the Glasgow to London mail train at Ledburn, Buckinghamshire, in August 1963, making off with £2.6m. The train's driver, Jack Mills, suffered head injuries during the robbery and never returned to work. He died in 1970. Biggs was given a 30-year sentence, but escaped after 15 months and went on the run for more than 30 years, living in Australia and Brazil. He returned to the UK voluntarily in 2001 in search of medical treatment.